Colin Chapman's famous mantra has been the inspiration for the new Cormate Utility 23. The aim has been to create a simple and minimalistic boat, but with quality, finish and details that belong at the top level of the premium class. This is true Cormate quality in every detail. Although simplification has been prioritized, the hull itself is highly advanced. Never before have Cormate boats racing genes been more apparent. Extremely low weight and a new and revolutionary central ventilated "Mono Step" provides an efficiency that until now has been impossible to achieve on a 23 foot Daycruiser/Walkaround boat. The aggressive delta shape with 24.5 degree Vee ensures sporty performance and comfort far beyond what’s usual in this class. Cost-effective production combined with an easy and efficient hull makes the boat very affordable and economical to own. Also from an environmental and emissions perspective the Utility 23 is in a class of its own. In addition to two large sun beds Utility 23 has a nice cabin with accommodation for two, the possibility of a flush toilet with holding tank and a quickly mounted canopy. It will be delivered in both outboard and inboard version. The boat is constructed by Egil Ranvig and is the first boat he designed in collaboration with his son Stian Ranvig. 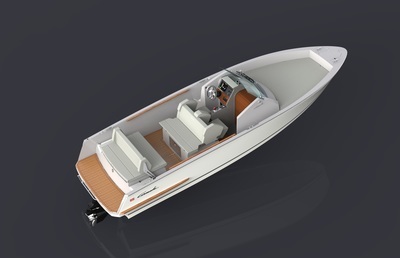 Utility 23 will initially be delivered in a more exclusive "Super Utility" version, with the new generation V6 and V8 Mercruiser engines of 250 and 350 hp respectively. Later we will introduce the outboard model "Utility Pro" with the new Mercury 115 PRO XS and standard model with the Mercury F115 and F150. We also plan a high performance edition, "Sport Utility". This edition is further lightened and reinforced by using vinylester/carbonfibre and comes with a supercharged Verado engine at 250 or 300 hp. On request, it will also be delivered as an “R-23 Edition” with a Verado 400R from Mercury's racing department. 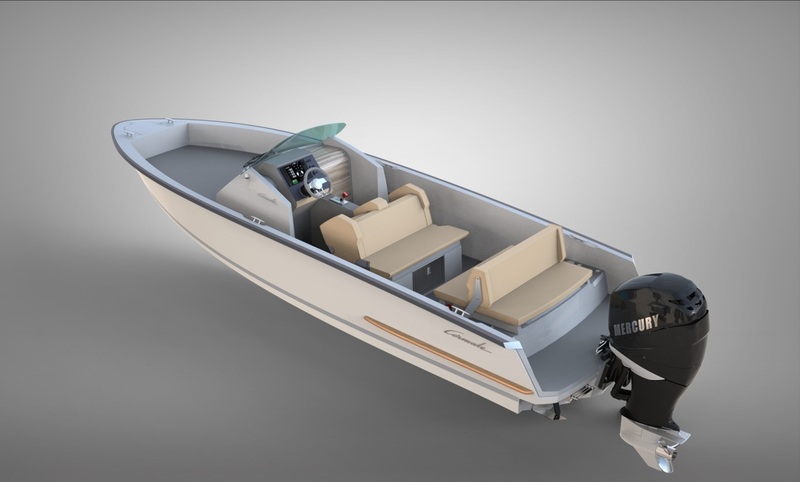 This boat will have a top speed of about 80 knots, but will only be delivered to approved buyers with the necessary speed experience and high performance powerboat handling skills. 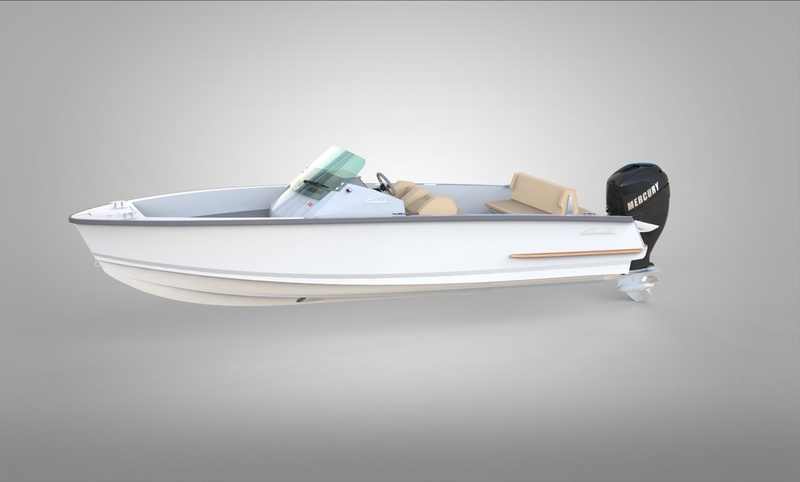 The entry-level “Utility 23 Pro” is specially built for the new four-stroke Mercury 115 Pro XS and will be able to achieve a speed of over 40 knots with this moderate engine. Consumption will be down to 0.55 l/nm in planning speeds, unique for a 23 foot DC/WA boat with cabin and accommodation for two. This has been possible by simplifying and lightening all the parts of the boat, there is no unnecessary panels and every square centimeter is minimized. Yet the outside areas are larger than on many other boats in the class. Needless decoration and "design gimmicks" are completely absent. Here it's all just about efficiency and function. As an example, the inner liner is bonded directly to the hull sides and forms a compact, stiff 40 mm sandwich panel. Furthermore, areas used for step and strakes minimized by constructing the boat with only one step list and a special "Mono Step". By central ventilation of the step through the self-drainage system (one of many double functions) it was possible to construct a much narrower step than normal. The Special Mono Step construction reduces the risk of oversteer and "Spin Out" at high speeds, one of the drawbacks you may experience with other stepped hull constructions. By making the last part of the bow straighter this has increased the hull’s water length, but not to the extreme, that bow approach does not provide enough hydrodynamic lift. Espescially when driving in high seas. Utility 23 also has an aggressive delta-bottom construction (hull width decreases fast toward the bow), but has still a relative moderate deadrise progression compared to many other modern hulls. The combination provides a precise and soft ride without an unforgiving "double rudder" effect. This further reduces the risk that the bow oversteers in following swells or a "Spin Out" at high speeds.